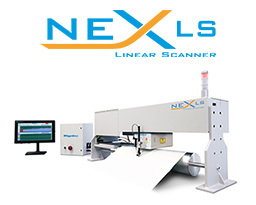 Featuring advanced third generation energy dispersive X-ray fluorescence (EDXRF) technology, the Rigaku NEX LS represents the next evolution of scanning multi-element process coatings analyzers for web or coil applications. To deliver superior analytical performance and reliability, the EDXRF measuring head assembly was derived from the established Rigaku NEX Series high-resolution benchtop instrumentation. With their proven technology, the Rigaku NEX LS delivers rapid, non-destructive, multi-element analyses â€” for coat weight, coating thickness and/or composition â€” for elements from aluminum (₁₃Al) through uranium (₉₂U). Rigaku NEX LS is specifically designed to service web and coil applications, with the ability to perform multi-element composition, coat weight or coating thickness. The measuring head is mounted on a rigid beam and is equipped with a linear traversing mechanism positioned over a roller so that the head-to-surface distance is constant. Where needed, elemental composition of a coating is measured directly. In contrast, coat weight (or coating thickness) may be measured directly (where counting rate for an element is proportional to thickness) or indirectly by measuring attenuation of some substrate element (where counting rate is negatively correlated to thickness). Benchtop EDXRF spectrometers have long been a familiar technology for release coatings, converters, vacuum formed plastics manufacturers and other industries using silicone oils as barrier layers, release coatings or denesting agents. Real-time scanning, for tighter process control tolerances, takes EDXRF technology for silicone coatings analysis to the next level. Silicone coatings are applied to plastic and paper substrates to modify the release characteristics of a product (like labels) or packaging. If too little silicone is applied or if there are areas of the web where the silicone coating is missing, the adhesive release properties will be adversely affected in release applications or the denesting characteristics of the vacuum formed plastic will be compromised causing product rejection or disruption in manufacturing and other downstream processes. If too much silicone is applied, the cost of the manufactured roll increases, reducing profitability and in some cases impacting acceptance and performance of the end product.